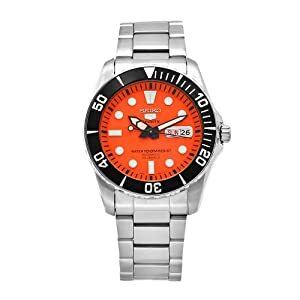 This sports watch is very cool looking with the orange face. The black bezel and brushed stainless steel band complete the industrial strength look. It's easily readable with large hands and hour markers - which are also luminous for nighttime viewing. Water resistant to 100 meters (330 feet) so it's safe to swim with it. It will stand up to heavy sweating during a soccer game. Day and date are visible on the face of the watch. This is a great watch for everyday use, and it just looks tough. I want one!